Beside Jesus, the Holy Spirit, and God, my favorite person in the Bible is Paul. At first, Paul was not a believer and participated in the execution of believers. He was struck down on the road to Damascus by God Himself – an encounter that led to his conversion to Christianity. He was temporarily blinded by the incident as well as Divinely commissioned to the service of Christ. Paul had visions and dreams given by the Holy Spirit, been raised to the third heaven and heard unutterable things, survived beatings that should have killed him, had prison chains snapped by an earthquake, received 39 lashes 5 times from the Jews, was beaten by the Romans 3 times, was stoned by his enemies once, was shipwrecked 3 times, spent a night and day on the open sea, and on frequent journeys, faced dangers from rivers, robbers, his own people, the non-Jewish people, dangers in the city, open country, sea, and false brothers. Paul faced labor and hardship, many sleepless nights, hunger and thirst as well as went without food often and was often cold and lacked clothing. Paul goes on to say, not to mention other things – he had daily pressure on him, had to care for all the churches and his hands had been the gloves of God in countless wonders. (2 Corinthians 11.21-28) WOW! and all this never diminished his faith in the Living God. I am amazed by the faith of Paul. What I am also amazed by is that of all the writers of Divine Scripture, Paul was inspired to write about prayer more than any other. In searching the Holman Christian Standard Bible, I discovered that in the letters written, Paul talks about prayer 26 times. In addition, he mentions words meaning prayer – supplication and intercession – 27 times. This man – who had been tortured on many occasions – is obsessed with prayer. So should we be. Why was he obsessed with prayer? Prayer is the mystery of Christianity and powerful. In search of ‘pray’ and ‘prayer’ in the Holman Christian Standard Bible, prayer is referenced 356 times in the entire Bible. Prayer for life, fertility, success, finances, healing, winning battles, thankfulness, and many more reasons. These have given us the example to not just stand by and let ‘whatever happens, happen.’ Whatever need we or our loved ones have, we can pray. Prayer matters everything. Our lives and the lives of the ones we love are shaped and influenced by our prayers. God is listening. 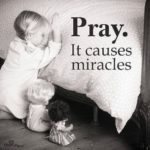 It does not matter the form our prayers take or the posture we take when praying, it just matters that we pray – and pray at all times for all things. Pray for your family, pray for your neighbors, pray for your teachers, pray for the ones stranded on the road, the homeless, the needy. Pray for healing and deliverance, pray for salvation of our loved ones. Pray, pray, pray.